Apple's iTunes has published the beloved 12 Days of Christmas once again, promising to bring us free goodies from December 26 till January 6. The application is supported by the iPhone 3GS, 4, 4S and 5, iPod touch 3G and up, as well as all iPads. However, Apple notes that even if you don't own an iDevice, you can still use your computer to get the free stuff and send it as a gift to someone, so you might as well "forget" to tell your best friend that the app is available and surprise them when the time comes. 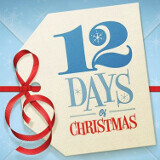 You can download 12 Days of Christmas here! Sorry but this app is not available in the US. It says UK only. Bummer!!!!!!!!!!!!!!! !